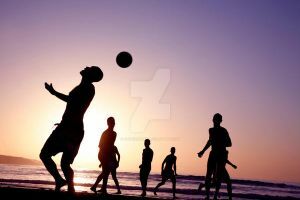 Curits (~captaincurt) and Junior (~juniorfilsinger) playing some soccer on the beach back in Brazil. Your work was featured in The F Word #8! This photo has been featured in my article - Around the World v.3 - South America. Wow. This is an amazing shot. Oh man it's fantastic. I collect it. It's such a great photo... colours, crispness, all top notch! I just wish there weren't as much noise in there though, it spoils it a little. Do you use NeatImage? If not, it may be worth giving it a shot. esta foto é fantastica! nem ha palavras pra descrever. o enquadramento, a cor, a luz, o momento... tudo perfeito! That's an amazing picture. I like it. What is the Font of the word " Challenge " please ? One of the best shots showcased on DA. By the way did you use any filter to get the tone. the tones really make the picture for me... lovely ! i agree. and i love this atmosphere here ! whats that font under the pic! ?